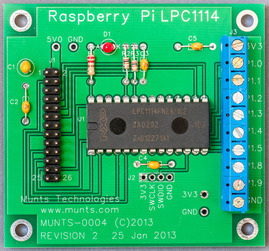 This is an LPC1114 ARM Cortex-M0 microcontroller based I/O processor and expansion board for the Raspberry Pi, with 8 GPIO pins from the microcontroller brought out to the terminal block. Each of the GPIO pins can be configured for a variety of functions, including A/D input, PWM output, GPIO output, etc. The microcontroller UART, SPI, and I2C ports are connected to the Raspberry Pi expansion bus. See the User Guide for more information. Includes 3" (75 mm) ribbon cable to connect to the Raspberry Pi P1 expansion header. USD $20 plus sales tax (Idaho destinations only) and shipping. Assembled and tested. RoHS compliant / lead-free. See the articles in The MagPi Issues 14, 17, 22, and 30. 25 January 2018 -- Added C++ classes and test programs for Unix, Arduino, and Mbed OS 5. 16 May 2018 -- Switched from the old deprecated GPIO sysfs API to the new GPIO descriptor API. Moved Raspberry Pi device and GPIO pin assignments from expansion_lpc1114.h to configuration file /usr/local/etc/expansion_lpc1114.config. 6 June 2018 -- Added support for Microsoft Small Basic client programs. 30 August 2018 -- Lots of C# housecleaning. .Net Core test program projects have been added and .Net Framework test program projects have been removed. Removed the XML-RPC .Net Framework library. 23 January 2019 -- Added a Remote I/O Protocol server. Added Ada transport packages necessary for clients to use the Remote I/O Protocol via Raw HID over libhidapi, libsimpleio, and libusb 1.0. I am available for custom system development (hardware and software) of products using the Raspberry Pi or other ARM microcomputers.